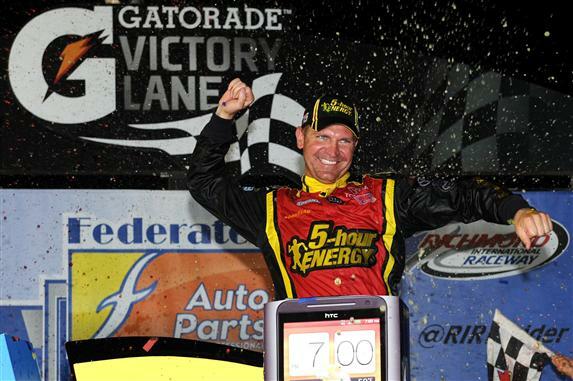 Clint Bowyer loped to his second win of the season as the race for the 2012 Chase for the Sprint Cup came down to the last soggy lap of the rain-delayed and rain-interrupted Federated Auto Parts 400 at Richmond International Raceway. Despite contact with Juan Pablo Montoya on Lap 235 that sent the No. 15 5-hour ENERGY Toyota spinning, Bowyer led the final 88 laps and despite fears he would run out of fuel, all but jogged backward across the finish line. His 1.1 second margin of victory could have been much larger. Bowyer's win bumped him to the sixth seed in the 12-driver Chase. "Unbelievable," said Bowyer, "To win tonight, the way we won it, we got the left rear knocked down, that ultimately ended up winning us the race." The No. 15 did victory burnouts, but the cameras focused instead on the second-place finisher Jeff Gordon. Though he started on the outside pole, No. 24 Drive to End Hunger Chevy dropped through the field in the early going, and when the red flag flew on Lap 139, Gordon's hopes of getting the second Wild Card berth seemed to be washing away with the rain. "We missed it," he said, "Its unfortunate." But crew chief Alan Gustafson's mantra was "Never give up," and his call for major adjustments to the car allowed the four-time champion to slice through the field, grabbing the lucky dog on the last yellow for rain, bumping his way past third-place finisher Mark Martin and into Chase by three points. "I felt like I had won the race when they told me that," exclaimed Gordon. "Went from last week to being the most disappointed I've ever been to finish second to the most excited I've ever been to finish second." Going into the race Saturday night there was a complicated list of possible scenarios for various drivers to get the Wild Card positions, but in the end it came down to the battle between Kyle Busch and Jeff Gordon. Busch's shot at the championship ended with a missed lug nut on a right rear tire causing a pit stop to go long, coupled with a call not to pit under the last yellow for rain. Busch ended up in 16th, giving Gordon the necessary points. Finishing in fourth place, Tony Stewart held onto his position in the top ten. From his 28th-place start, the No. 14 Office Depot team struggled here and there but by Lap 285 took the lead. While there's some question as to whether Stewart purposely relinquished that lead to teammate Ryan Newman, nothing less than a win would put the No. 39 Quicken Loans Chevy in the Chase and Newman just wasn't fast enough to keep Bowyer from passing him. Newman finished eighth. Post-race Stewart was asked how important it was to him to be able to keep the nine points that came with his three wins. "Knowing that it came down to one point at the end of the year last year. Those nine points are huge right now, he said. "Nine points doesn't sound like a lot, three points doesn't, but when it came down to it, one point was the biggest you've ever seen in your life. It was a big deal for us tonight to make sure we stayed in the top 10 and make sure we got those bonus points and didn't lose them." Matt Kenseth brought the No. 17 Best Buy Ford home in fifth, battling Jeff Burton who had been as high as third before dropping back to sixth. 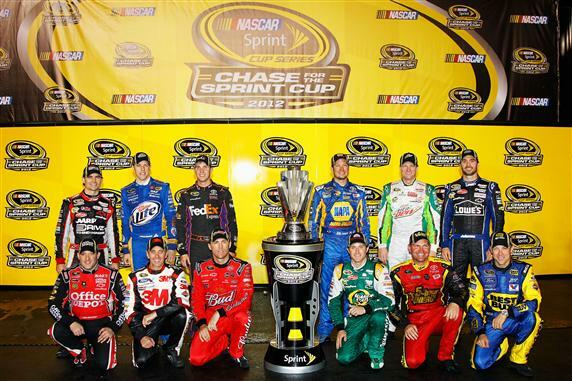 Others top-ten finishers were Brad Keselowski in seventh, Greg Biffle in ninth, and Kevin Harvick in tenth. Sam Hornish Jr. finished 11th, the last car on the lead lap. For the full finishing order, click here. Rain delayed the race start until 9:15 p.m. On Lap 139, caution came out for precipitation and the red flag flew on Lap 152, stopping action for nearly 52 minutes. Of the six cautions, surprisingly only two were for contact. While the beating, banging and bumping that had been predicted never materialized, there was no lack of drama. From the time the race went green after the rain, every lap counted, every position counted, and the tension rose to shouting, jumping-up-and-down, nail-biting levels before the checkered flag finally waved, ending the regular season and setting the stage for the Chase for the Sprint Cup.